Something I’ve never done before, and I almost pulled the trigger. Yesterday, I went on a whirlwind three-store shopping trip, purchasing everything in one go so I could just stay at home and bake and cook today and tomorrow in preparation for Thanksgiving. Knowing I had four pies to make, and knowing what a PITA* it is to make g.f. pie crusts, I sought out the freezer case of Sprouts, my local natural-foods grocery store. I stood there, looking at the empty section where the gluten-free pie crusts should have been, and glanced at the price tag — $4.99. I’m not sure if that was for a single crust or a double-pack. In any case, they were out. Cheap-o that I am, the price tag dissuaded me, anyway. I just couldn’t spend $10-20 on something that I knew I could do, myself. 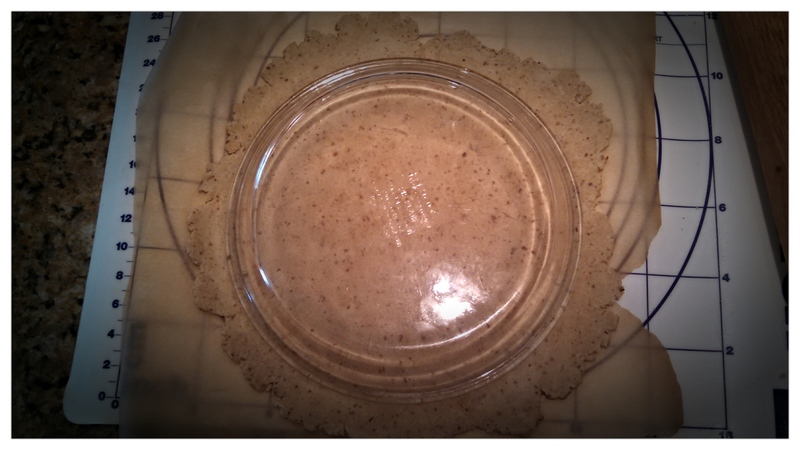 Four pie crusts are now made and in the fridge, waiting for filling tomorrow. I thought I’d share how I am able to successfully roll out and transfer gluten-free pie crust into the pie pan without it breaking into a dozen pieces. 1. First, plan on 1 1/2 cups of gluten-free flour per crust. “Normal” recipes for a 9″ crust will use only 1 cup of flour. 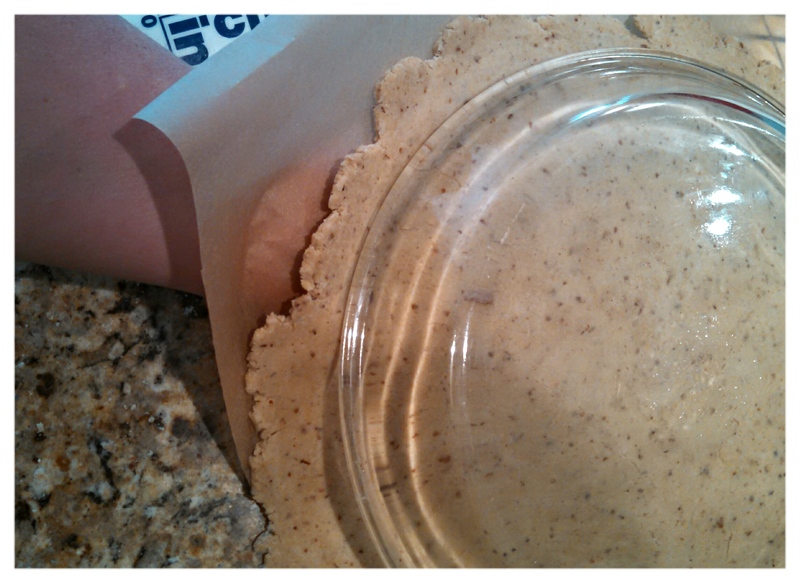 However, it is helpful to roll your crust just a LITTLE thicker than wheat-based crusts. Also, it is often useful to have just a little extra dough to work with. Gluten-free dough dough doesn’t adhere to itself as well as wheat-based dough, so your edges (before you trim — see below) will be more raggedy. 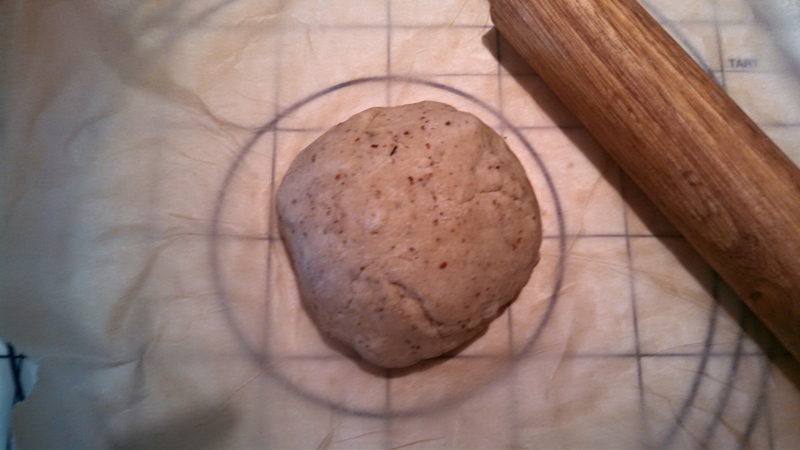 Rather than fret about not having enough dough, just allow for extra on the outset. (Also, below, I’ll tell you what you can do with the left-over dough.) I use six cups of mix for four crusts. 2. Secondly, but most importantly, you need parchment paper, the kind used for baking. I have tried this with wax paper and with plastic wrap, as well, but it is really only successful with parchment paper. 3. Gather your lump of dough — mine is speckled because I put some unblanched almond meal in with my mix of flours — in the middle of a square of parchment paper. A pastry mat with guidelines is helpful, but not necessary. 5. Turn your pie pan over upside-down, and center it on top of the circle of dough. 6. Slide your hand under the parchment, keeping your hand as flat against the counter top as possible, gently lifting paper, crust, and pie pan. Place your other hand on top of the pie pan (which is, again, upside-down, so the palm of your hand is against the bottom of the pie pan). So now, your hands are sandwiching the paper, crust, and pan. Spread the fingers of your hand that is underneath as wide as possible to support the dough, and quickly flip your hands over. 7. Leaving the parchment in place, gently press the dough into place, snugly against the sides and bottom of the pan. 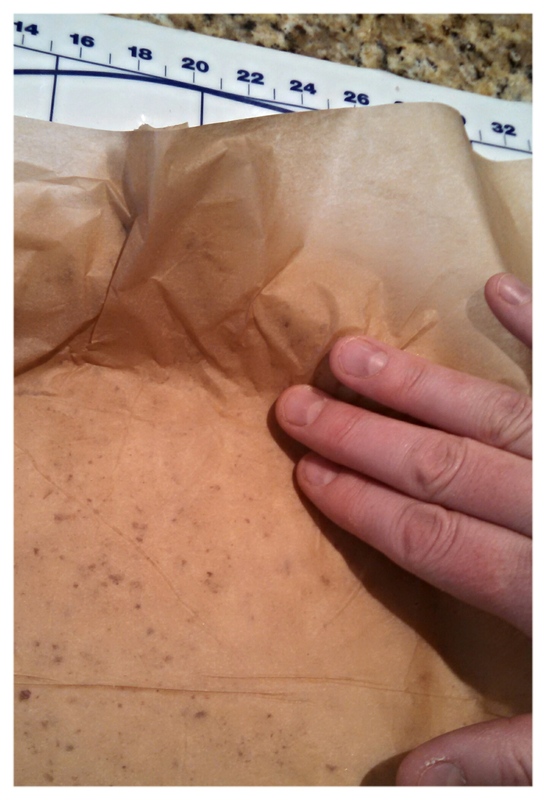 Then, gently remove the parchment paper. The beauty of parchment is that the dough adheres just enough to keep the crust intact while you flip, but not TOO much, so that the parchment peels cleanly away. Yes, I have bitten my nails. That alone was almost enough to NOT want to do this tutorial, so y’all couldn’t see my hands. But, I’ve heard enough groans about homemade g.f. pie crust from the gluten-free community that I thought I’d cast my pride aside and give you all a (nail-bitten) hand. 9. 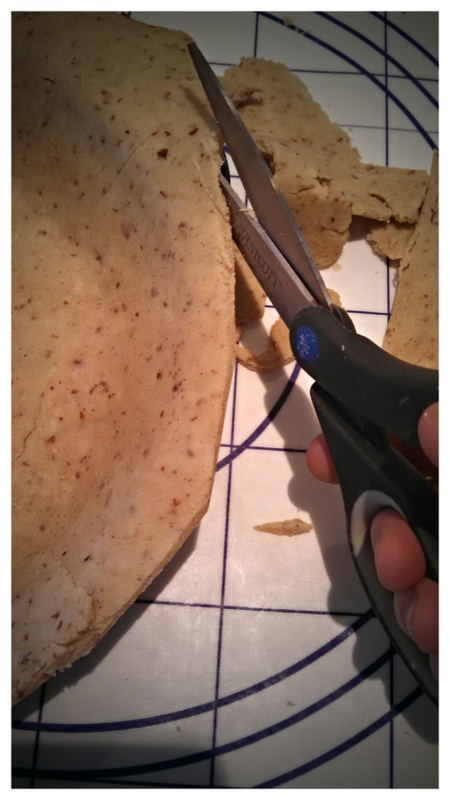 Next, using a clean pair of kitchen shears, trim the dough so that it is even with the edge of the pie pan. 10. Fold the outer 1/2″ or so of the pie crust against itself, pinching gently, so that you have a double-thick top edge of your unbaked pie crust. Gluten-free dough WILL be more crumbly than wheat-based crust, so smooth the top edge of the crust as you go, until you have a sort of blunted top edge. 11. 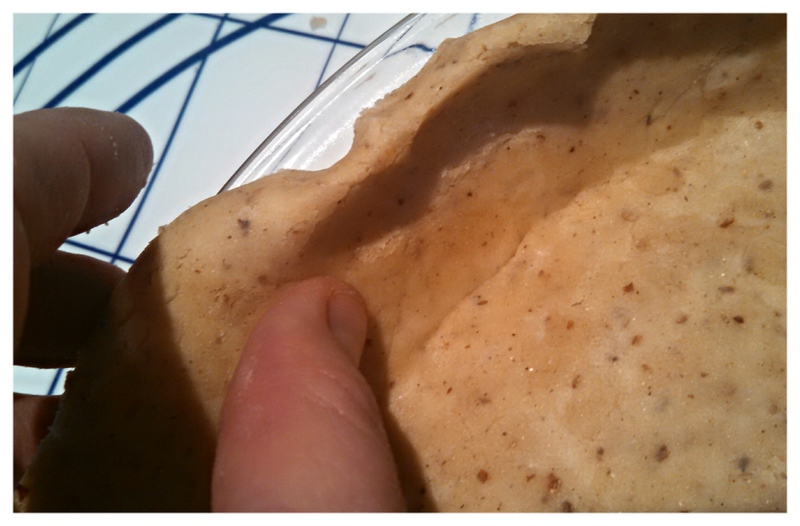 Next, using your thumbs and forefingers (or a fork), pinch the edge of the crust into a decorative pattern. And, voila! You’re done with your unbaked pie crust with an edge that is standing up high enough to support most deep-dish pie recipes. And if your recipe isn’t for a deep dish pie, you’ll probably just have the edge of the crust standing tall, surveying your beautiful homemade pie. You can pre-bake — also called blind baking — your crust as directed by a recipe (like for lemon meringue pie), or use it as is for pumpkin or pecan, or any other pie that starts with an unbaked crust. Or, you may refrigerate or freeze the crust until you’re ready to use it (make sure it is nicely sealed in plastic wrap so that the crust doesn’t dry out). 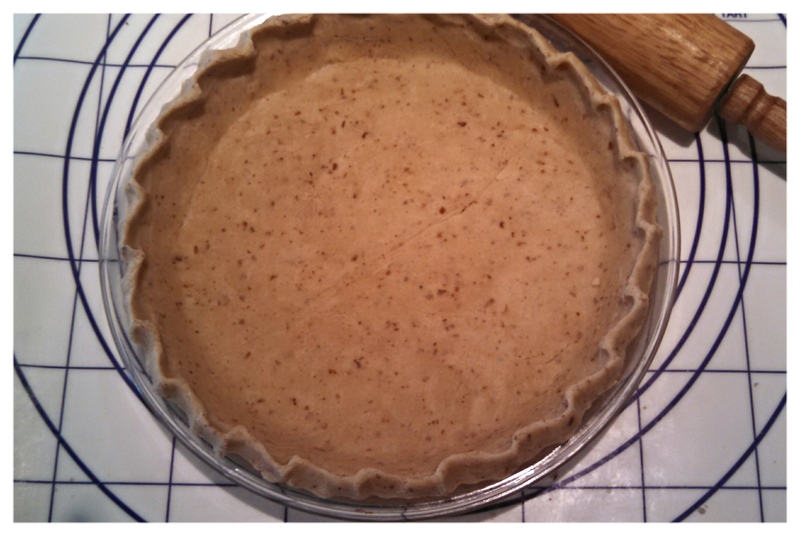 One note about pre-baking: Definitely use pie weights (or beans or rice) when pre-baking a gluten-free pie crust. Depending on the flours used, many g.f. flours (especially the whiter ones — starches and rice flours) can shrink during baking. Using a weight helps minimize this. 12. 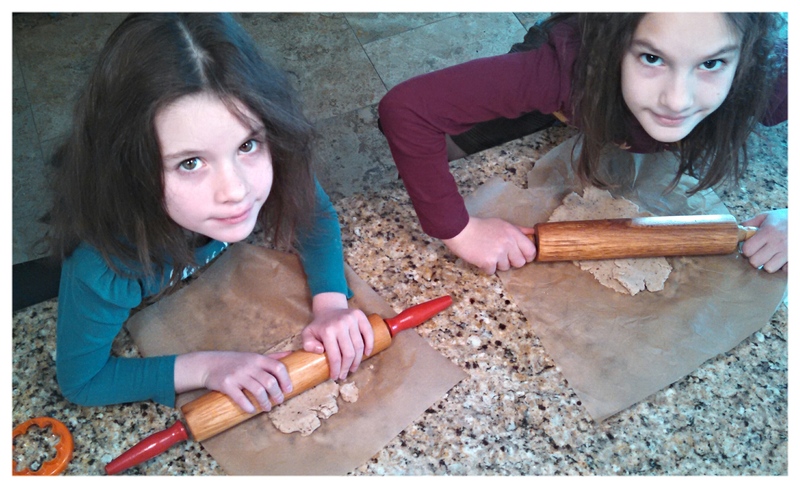 Lastly, you can give any leftover trimmings of dough to the aspiring baker(s) in your home, and set her free with a rolling pin and cookie cutters. Place the shapes on an ungreased cooked sheet, sprinkle with cinnamon sugar, and bake at 375 degrees F until lightly browned, about 16 minutes (depending on your pan, and how thick the crust-cookies are). Note: Check finished cookies for hair. Eek. *This is as close as I will come to cussing on this blog. Or in real life, for that matter. Posted on November 25, 2014, in Cooking/Baking/Food/Recipes, gluten-free and tagged Crust, gluten-free baking, Holidays, Homemade, Pie, Pie crust, Thanksgiving. Bookmark the permalink. Leave a comment.